What Did Bank of America Know and When Did They Know It? Are the powers that be at Bank of America wilting under political pressure to release the details of its merger with Merrill Lynch? In fact they are and in the process, the executives at Bank of America are agreeing to waive attorney-client privilege. What are the critical points which New York Attorney General Andrew Cuomo, the SEC, those in Congress, and especially Bank of America shareholders want to learn? 1. What did Bank of America know about the ongoing deteriorating financial position at Merrill Lynch? 2. What did Bank of America executives share with their board members about the billions in bonuses to be paid at Merrill? Mr. Cuomo’s investigators, as well as Judge Rakoff, have said a fuller accounting of the events surrounding the deal is a prerequisite to any resolution of the probes. BofA is hoping releasing the privileged documents will satisfy those demands, according to people familiar with the matter. BofA’s move will likely reveal exactly what advice was provided by outside firms, according to people familiar with the matter. Those firms include Wachtell, Lipton Rosen & Katz, which represented BofA during the Merrill transaction and is a long and trusted adviser to the bank, as well as Merrill’s counsel, Shearman & Sterling LLP. It may also show conversations with ex-general counsels Timothy Mayopoulos and Brian Moynihan. Bank of America recently hired law firm Paul Weiss Rifkind Wharton & Garrison LLP to join Cleary Gottlieb Steen & Hamilton LLP in representing the bank in the various federal and state investigations surrounding the Merrill acquisition. “This is going to get to the down-and-dirty question of what counsel did say and did not say, what counsel meant and did not mean,” said James Cox, a law professor at Duke University. 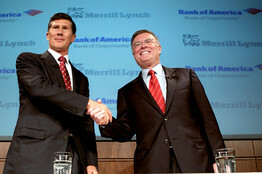 (Associated Press) In a photo from Sept. 2008, Merrill Lynch Chairman and CEO John Thain, left, and Bank of America Chairman and CEO Ken Lewis shake hands following a news conference. Down and dirty? I love it. Get the extra large popcorn. This should be good.